Lucy Grace’s one act, one woman show is charming in its simplicity, its honesty, and her sympathetic delivery. 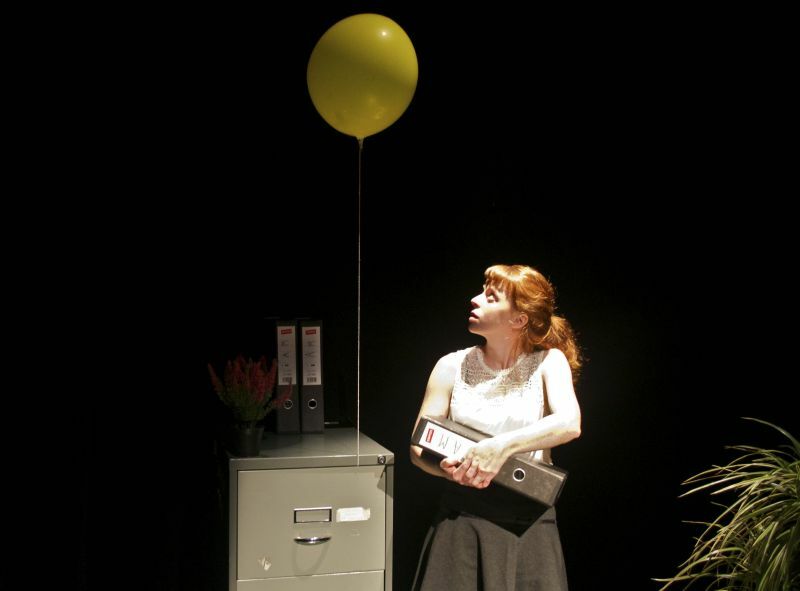 It comes to Brighton following a successful run in Edinburgh last year and shares the story of one young woman’s quiet revolution against the conformity of office life, triggered by her theft of a neglected office plant, and the beginning of an exploration of her own wildness. Our protagonist’s vulnerable but guardedly optimistic demeanour is familiar and endearing and her little asides appended to the main narrative, the bon mots that could be read as non sequiturs, the internal monologue that sometimes leaks out into conversation, all make the audience feel like a confidante, like we’ve found a friend. Which is all ‘Lucy’ truly wants to do, even if she is made to conform to expectations of interaction and corporate ambition. To define where she sees herself in The Bigger Picture. Whatever that may be. A dracaena is a sacred plant. Lucy knows this and no one else around her cares. It isn’t relevant. This is important. One image which particularly lingered was that of Lucy, after spending the night euphorically painting her ceiling to resemble the sky, carefully and deliberately dipping the cuff of her work jacket sleeve into the pot of blue paint, before carrying it with her like a secret into the day. On her commute she covertly insinuates a daub of blue onto a fellow sheep, penned into the 8am to London Bridge, and imagines him discovering it later in his day, possibly having transferred that furtive scrap of sky onto others in the mean time. Though there is of course no pot of paint on the stage, no train carriage, nor supporting cast, it is such a clear and haunting image – as distinct as the white chalk in Fritz Lang’s M – that it felt tangible, marking an aching need to connect, somehow, with other humans, to share a little wonder at the simple, beautiful things left in life in between the downbeats of conformity. Lucy’s first deviation, stealing a much-abused office pot plant entrusted to her guardianship as part of a ‘greening’ scheme, passed down from HR or some such nebulous entity, is a minor infraction, a socially-aberrant good deed. It is also the first step in a spiral of isolation and (mostly) internalised abstraction that feels like it can only end in crisis, or worse. So much theatre, especially the Fringe kind, particularly the plays that draw on mental health struggles, is a headlong plunge into tragedy. Garden is an exercise in learning to regain trust, in hopefulness, in the potential of magical thinking to sometimes deliver. To suggest there are times when things are okay. The show’s greatest strength is being funny in a way that encourages us to laugh with the protagonist at other people’s cynicism and literalness. At, in fact, our own, as their reactions would most likely be ours. Yet with Grace explaining her character’s quirky acts we are granted the gift of seeing them not only through the perspective of the people around her, but also with the secret password that unlocks the additional content – narration, subtitles, a red-button voiceover telling you exactly why that innocuous, if slightly odd woman on the train, the one you’ve stood in the same carriage with dozens of times before and never once noticed, seems to have a pocket full of soil. No one who ever loved woodlice as a child and then forgot they ever did is too far removed from the path Lucy wanders down. It’s a simple, messy, honest little play full of heart and dejection, ambivalence and hope. ‘Lucy’ is an awkward everywoman played with immensely likeable vulnerability, a few props and a neat lighting design. Garden is physically spare, but emotionally rich and proof that you don’t need projection, or speed eating contests, or paint slung up the walls, to make a Fringe show that is engaging and relevant. It’s startling how revolutionary optimism can feel.